Sometimes evil spirits get uppity and need to get their walking papers...or at least, sometimes people think that's what's going on. Usually it's not the case if magic is being done right. A good magician will go through rituals and ceremonies which establish his place of working and his authority as well as his spiritual allies in a way which results in being mostly safe from that problem. Mostly. It's still possible something can come up. On the road to becoming a good magician it's also possible something problematic can arise. Normally it won't be anything that isn't easily handled. Still, it's important as a magician to have the tools to handle such an issue, for yourself or for others where it may arise. For the methods being described here they will be sufficient for dismissing the common sort of spirits that one may encounter from normal activity as well as for providing some basic protections. They will not cause any particular harm in a situation where the spirit is not the problem. Because it is very possible, and often likely, that there is a non-spiritual cause for problems one is experiencing those not thoroughly trained in examining such problems should also explore various mundane causes and solutions. That having been said, let's look at solving the problem of vexing spirits. There are a lot of traditional sorcery methods for such things. In fact, that's a big part of the job of a local sorcerer traditionally. As a kid and young adult, I tended to use pretty pagan methods, banishing by the elements and by tools and signs of authority. These types of methods all work pretty well. As an adult though I have also begun incorporating methods more linked to ceremonial magic and Catholic mysticism. A couple simple methods of this variety are what I'm going to present today. Recently I was having an issue that seemed to be unruly spirits. Quick solution? I have a box of rosaries dedicated to Saint Benedict, whose patronage includes exorcism and the destruction of evil sorcery. I also have a handful of Benedictine medals on bracelets. I popped on a bracelet and hung a rosary over my bed. The issues stopped immediately. This is basically the use of a talisman. In this case a talisman specifically set towards banishing spirits. Similarly a talisman dedicated to the archangel Michael could be used the same way. Or if you knew what spirit was vexing you you could use a talisman dedicated to the angel who commands that spirit. That would be a bigger process to undergo. So as a catch all, conjure Michael to consecrate your Benedictine talismans before use. Such a conjuration could be done as a general precaution and the talisman wrapped and put away until needed. For those not ready for a full conjuration a simple prayer could be used. Pope Leo XIII penned this prayer to St. Michael the Archangel after a vision of a war with evil spirits in which Michael was casting them down. Interestingly enough Leo III was the Pope to whom the Enchiridion was ascribed. Be my protection against the onslaught of evil spirits. 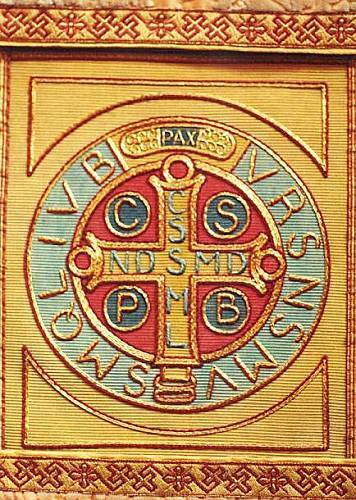 With either prayer end by tracing Michael's seal above the seal of Benedict and whisper Michael's name into the seal. If you have to deal with a spirit aside from simply using a talisman and wish to banish, the opening banishings of more traditional ceremonial magic can be useful. Not things like the LBRP, or LHR, these are rituals of a mystical quality which can be applied practically, rather than practical rituals straight up. Opening using the Chaldean Oracles can sanctify a space and remove minor disturbances. The Enchiridion has some great exorcising Orisons which can be used for such purposes or as the openings of rituals. The psalms used to establish the working space in the Greater Key, as well as prayers of constriction and banishing from the grimoires. The problem with these is they're usually kind of long and need to be looked up. For the most part they're designed to be used in a larger ritual. They also might be overkill for small disturbances. Something easy to memorize which is more than sufficient for the average disturbance is the Vade Retro Satana which is built into Benedict's seal. 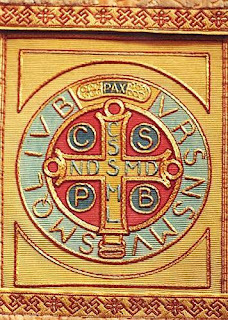 This small exorcism represents several points of the mythology of Saint Benedict, principally a story of a monk who attempted to leave his guidance and was almost consumed by the devil before returning, and attempts to poison him which were miraculously defeated. This one would take less adapting to make it more comfortable for the contemporary magician. The Holy Cross of Light is already a symbol used heavily in the Western Mystery Tradition. This can be associated with the Rose Cross, which is a highly appropriate symbol for such work. Being tempted with vain things is precisely the antithesis of the magician. Satan and the Dragon are the only images that may be less fitting, although the Dragon appears in the Enochian materials as the Telocvovim or the Death Dragon, another name for Coronzon. A consecrated candle, or a ritual sword or wand could be used as a tool in conjunction with this exorcism. The Benedictine talisman could be used in conjunction with this as well. The charm references the cross of light and so the Rose Cross sign can be made in conjunction therewith. The charm references the destruction of poison bread and wine as well. A ritual involving the destruction of a false Eucharist and consumption of one truly consecrated could be employed as well. So none of these methods is particularly difficult. Unfortunately the expulsion of vexing spirits isn't something that gets treated a lot in most readily available magical writing. It tends to be assumed that this is something for which people need to seek out someone's assistance. In a case where things are pretty intense that is probably sound advise. In cases where something is just giving you the heebie jeebies or disturbing your dreams these techniques are sufficient, at least as a starting point. Again, there are a lot of serious mundane problems that people at times mistake for spiritual affliction. Be careful to thoroughly examine those possibilities. Where necessary seek out the help of those who can help you explore those possibilities. There are magicians who do things against other people, there are spirits who cause problems for people, the popular sentiment that this is not the case is false, but it remains true that it is also not the most common occurrence. Be ready to protect yourself, but also be intelligent and responsible.